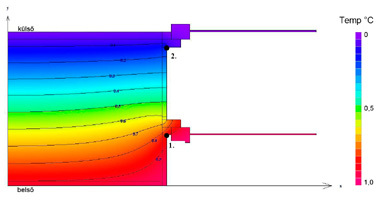 Although the results of several research have been published in the past 10 or so years according to which a traditional double-layered window with exterior shutters or boxed shutters are no worse in any aspect than a new single-layered thermo-glazed structure regarding the heat-loss calculated for the entire surface, these data do not actually reach the wider public. The same holds true of the fact that the replacement of windows consumes more energy as a waste through heating from an energy-economizing viewpoint which is capped by the replacement of plastic windows every 30-40 years: these latter structures are not upgradable, as opposed to 200-250 years old wooden windows that have already been proven to be renewable. These non-degradable products raise serious environmental issues. In the 1970s old windows were replaced in large numbers as a result of the first global crisis related to oil and energy consumption. The new single-layered plastic and aluminium doors and windows have played an important role in the market of building materials exploiting the fashion of replacing windows. All these „western” countries have realized by now the enormous values that had been lost whilst replacing windows and their professionals and experts now warn us against doing so. The new structures are examined from only one aspect: construction physics and the continuous improvement of the heat transmission values. But this is only one of several thermotechnical parameters. In the case of „modern” products it is only some sections of the manufactured profiles that produced good values (4–6 cells crossing each other), whilst they have no good results at all at the closing parts, where the heat is actually escaping (it is proven by thermo-photos). As opposed to this, the traditional double-layered (jointed box-type window) window behaves like a „daily heat trap”: at night they pass on the heat received by daytime towards a room. Another advantage of its application is the slow and continuous change of air, whilst the (deliberately produced) perfect closing of a modern window results in the increase of relative vapour content in the interior as well as the starting of the moulding process. However if we keep the openings open to prevent moulding (such gaps or holes are already built in the new generation of plastic doors and windows), air shall escape through the airing holes as well as the heat, just like in the case of an old window. When providing the U-values of products this heat-waste had been left out of the calculations: in case there was mechanical airing in the building, these openings could be kept closed. Practice, however, is just the contrary. Efficient sound insulation is yet another argument for double-layered traditional windows. According to measurings, the distance between two layers of glass defines the suppression of noise: the best results are when it is 7–12 cm. And the traditional (jointed box-type) window perfectly meets this criterion. As a summary we can say that our historic windows are environment-friendly and energy-saving structures, despite the common view. The most acute problem is that manufacturers promote their products as if they were installable in old buildings. Despite replacement, however, only a few people know of the methods of modernizing old windows as alternative solutions. As the contractors are not interested in upgrading, because it requires more live labour, they tend to prefer solutions holding the promises of more profit, and shift responsibility to the manucfacturer of windows. 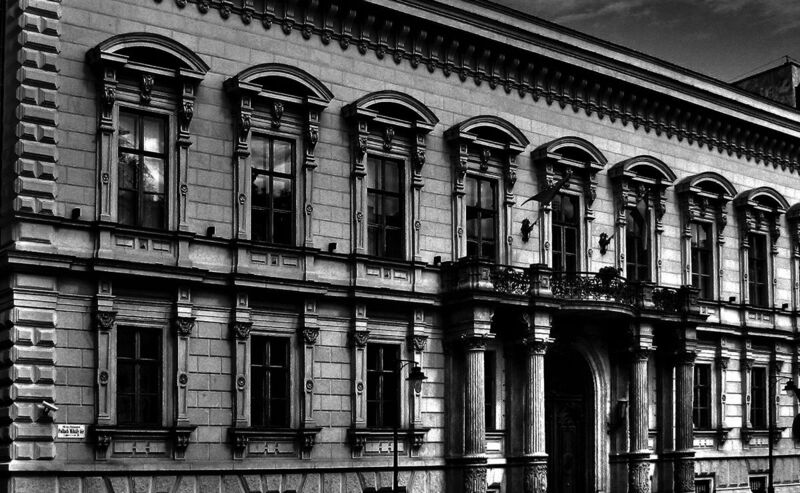 As the attention of professionals is primarily focussed on the individual protected historic buildings now all over the world, and the protection of city- or streetscape is emphasized less, we as users of the building or owners of the windows are to consider the values traditional sophisticated windows represent. We should not replace our windows as they had been made of excellent and clean-boled, selected wood with dense annual rings till World War I, which means their material can be made of good use still for quite a long time (photo: a section of a window profile made in 1907). We are not to believe the carpenter trying to persuade us to buy his new product arguing „this one cannot be saved any more” – see the English-language lecture delivered by Michael Bidnell at the symposium and the German-language bibliography items. If necessary, remove the excess stain or paint where the window does not close. Remove the peeling paint within some minutes. Buy some raw linseed oil from a paint supplier. Spread it over the window on the outside twice, especially at the outer weather board, if it already lacks paint coat. Warm it with a hairdryer so that the wood shall soak in the oil throughly. 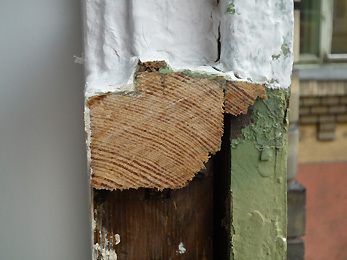 This way you can prevent the further deterioration and decay of the wood of the window. It is now a proven fact that the best window paints are natural linseed-based. Linseed is the most important treatment for the protection of wood. Back in the old days people protected their windows by spreading hot linseed oil over them. Synthetic paints tend to peel because they move in a different way than wood. This is why we warn against applying them on windows. The window is first cleaned, and overhauled so that hinges and catches operate easily. Buy flexible and stainable acryl in a tube squeezeable with a sprayer gun in a paint shop. A good example is soudal used by paintermen for sealing holes (priced appr. 1,500 HUF): it is similar to silicon available in DIY-stores, but those are not cuttable after drying. However, you can cut acryl with a modelling knife. Open the inner sash and squeeze the acryl as an unbroken strip all round on the groove (bumper, onto which we usually stick any other sealing). Cut out appr. 8 cm wide strips out of a plastic. Cover the acryl with them everywhere (it shall stick to it). Close the window gently, so that the plastic would cover the acryl everywhere without touching the case. Open the window after two days. The plastic shall come off the dried acryl. Cut off the excess what had been squeezed out of the bumper. You can lay it down if you wish. This solution is a good one: in case the gap is not an even one all around and the window has distorted, it shall take on the shape of the case after the application of this method. Because of the excess the window shall not be tense as it would be when applying a sealing band of the same cross-section. In case the window does not close yet everywhere, you can repeat the method and correct watever deficiency still there might be. Thanks to the flexible acryl sealant the window shall close perfectly. Try out this method and do not replace your windows any more. By replacing traditional windows for new ones we also change the character of building as well as the townscape or cityscape. Plastic windows cannot be upgraded and must be replaced in 30-40 years time for sure. (Today, most sealed units carry warranties of only 8 to 10 years.) Windows with insulating glass come with only a 15 to 20 year warranty; when the sealant fails, the window will lose its insulating quality, the glass will fog. Wood windows can be in service for 100 years before requiring a major retrofit to remain in service for a second 100 years. In case of new windows the case and the sash are typically twice the size of the original. Compared to it the new one shall have a smaller glazing which limits the view and decreases the quantity of incoming light. Try it out! Imagine that your window shall have a frame twice as wide as the existing one. Measure how big the glass shall be this way. By removing the old windows and the installation of the new one the surrounding wall surface shall be damaged. A replacement of windows is not always accompanied by the repainting of the facade and the interiors. Polyurethane (PU) foam is becoming widespread now and profiles used for concealing them breaks up the integrity of the facade even if they are installed with the best intention and involve the reproduction after the original window design. Installation with PU foam is not enough in itself. Whereas the traditional technologies of wall-construction may be regarded as perfect as far as the installlation of windows into the wall is concerned, in the case of new windows the ageing and the peeling of the old fixture may be dangerous, just like the appearance of a thermal bridge and the condensation of vapour if the sealing is a broken one. PU-foam should not be squeezed into the gap so that it bulges out: this way they cut off the excess and vapour can get into the PU-foam itself on the cut surface. According to regulations PU foam should be covered with silicon all over, but contractors do not need to comply with this in practice. However, PU foam can turn into a deficiency in an old wall structure. Wooden windows on old buildings do not only meet the formal criteria, but also the construction physical values, the technical characteristics are better as compared with the plastic and aluminium windows. The contemporary and yet existing double-layered windows generally have a 43 mm + 43 mm, that is 86 mm wooden frame with much better values of heat-insulation (U: 1,1 W/m2K) than the ”latest” and multi-chambered plastic or aluminium frames rated as ”modern” ones. The selection of materials: The most important argument against the application of wood is that it needs continuous repainting, and against plastic ones that they are altered due to the exposure to weather condition. Both arguments are false in such a simplified form. The damage to wood does not only depend on surface treatment, whilst both plastic and aluminium windows need a kind of surface treatment or cleaning. The damage to plastic caused by the weather depends on the kind of plastic and their durability have not yet been proven by many years of usage, and we do not even know its life expectancy. Soundproofing: Sound gets through the window in two ways: the airsound through the joints and the body sound throughout the entire construction. Sound insulation is better if there is more distance between the two layers of glass. The quality of sound proofing depends on the thickness of the glass and the distance between the two glass layers. As for sound proofing the window with united sashes and the united double-layered traditional windows have the best parameters, as there is typically a 15 cm airgap between the two glass layers. 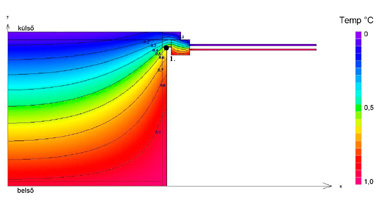 Thermal condition of a new single-layered window with thermal glazing (horizontal section). The wall is much colder next to the window. Mould had appeared on the inner reveal of the window as the result of the (moisture) condensation on the cold wall. For more detailed reasoning please see the bibliography in the menu. WHY SHOULDN’T I REPLACE MY WINDOWS? • Replacement wood windows are made with new growth lumber that’s not as strong or rot resistant as the old growth lumber used in windows made before the 1950s. • Insulated glass-seals tend to fail in 2 to 6 years allowing condensation between the panes. • Most insulated glass panels cannot be replaced once they fail. The entire window must be replaced. • Primary window sashes were never intended to take a direct hit from the weather. In early years they had shutters then storms to protect them. • Air infiltration is the biggest energy issue with windows. Vinyl windows, by their nature, have weep holes in their bottom rail to let the moisture seep out which allows massive air infiltration. • PVC or vinyl is the most toxic substance manufactured today. It can’t be recycled; off-gasses toxic fumes and has excessive contraction and expansion issues. It fades, cracks and has a maximum lifespan of 16 to 18 years. • Metal clad windows are designed to allow water to seep behind the cladding. This causes early rot of the often finger jointed, new growth lumber underneath. • The vinyl jamb liners that are needed for tilt-in windows have cheap spring balances and cheesy foam backing that have a lifespan of about 6 to 10 years. • Double hung windows were invented in the 1400s as an air conditioning system. Lower the top sash and raise the lower sash. This lets the hot air and humidity out the top and brings the breezes in through the bottom. Most replacement units don’t have a full screen to allow for this process. • Aluminum, self-storing storm windows are not even a good windbreak. Metal conducts heat and cold while wood insulated against heat and cold. • Sash weight pockets are only a problem if a house has not been caulked and painted properly. • ¼ “, laminated glass has better UV protection than all the low-e coatings. It also approaches similar thermal capabilities as insulated glass, is more soundproof, is safer and cost less than insulated glass. If retrofitting energy efficient glass into an old sash is something you feel must be done, install laminated glass. • Original window sashes are a part of the footprint of your old house or building. Replacements often have different dimensions and sometimes the window contractor wants to reduce the size of your openings. This has a negative effect on the overall texture and look of the original footprint of your building. • If you don’t want to lift a finger to maintain or renovate your home then hire a contractor to restore your windows. Your restored windows will cost less, have a better payback, be easily cleaned, have a nice track system, and stop air infiltration which means great energy efficiency. • Restored wood windows have another 100-year economic life before total restoration is needed again. Replacement windows can never be restored effectively.